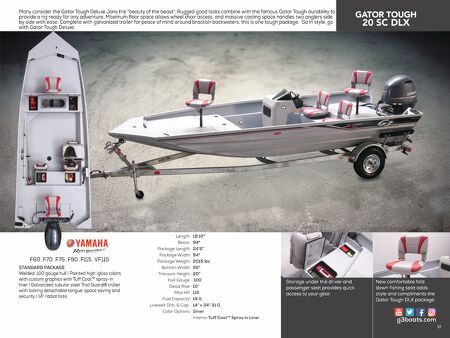 The largest of the Gator Tough™ Deluxe lineup provides the toughness and capacity you need to challenge the big water and big fish. 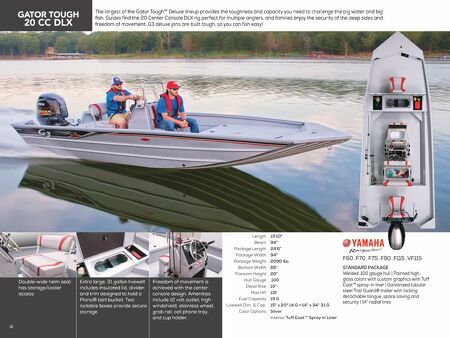 Guides find the 20 Center Console DLX rig perfect for multiple anglers, and families enjoy the security of the deep sides and freedom of movement. G3 deluxe jons are built tough, so you can fish easy! STANDARD PACKAGE Welded .100 gauge hull | Painted high- gloss colors with custom graphics with Tuff Coat™ spray-in liner | Galvanized tubular steel Trail Guard® trailer with locking detachable tongue, space saving and security | 14" radial tires Double-wide helm seat has storage/cooler access. F60 . F70 . F75 . F90 . F115 . VF115 19'10" 94" 24'6" 94" 2090 lbs 66" 20" .100 10° 115 19 G 15" x 20" 14 G + 14" x 34" 31 G Silver Interior Tuff Coat™ Spray in Liner Length Beam Package Length Package Width Package Weight Bottom Width Transom Height Hull Gauge Dead Rise Max HP Fuel Capacity Livewell Dim. & Cap. Color Options 56 Freedom of movement is achieved with the center console design. Amenities include 12 volt outlet, high windshield, stainless wheel, grab rail, cell phone tray, and cup holder. Extra large, 31 gallon livewell includes insulated lid, divider, and trim designed to hold a Plano® bait bucket. Two lockable boxes provide secure storage.